Well, Rip Kastaris has done it again. 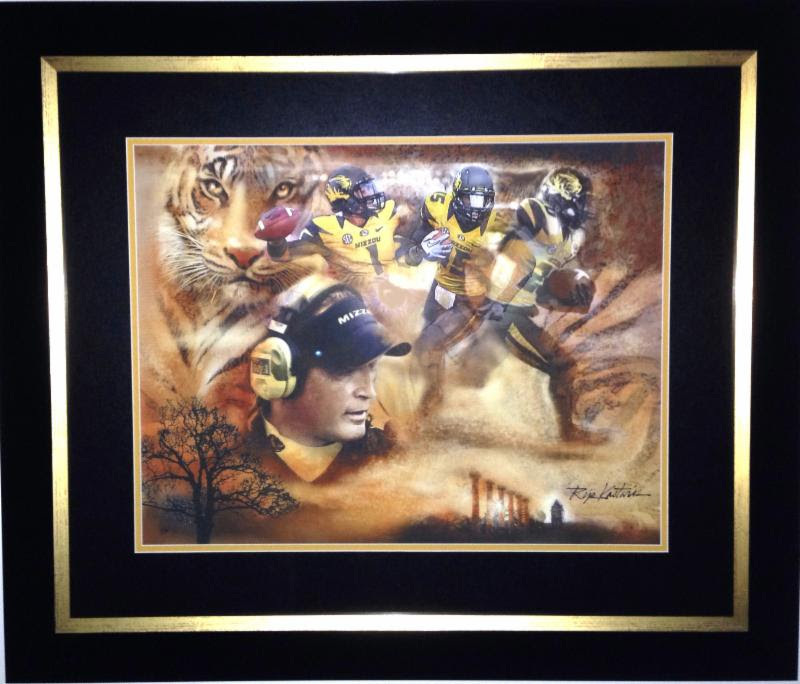 His latest sports painting entitled "Tiger Territory" captures the essence of Mizzou tradition/history and their amazing 2013 - 2014 football season of the Mizzou Tigers ending with the Cotton Bowl victory, 41-31 over the Oklahoma State Cowboys. This giving Mizzou their 12th victory for the year. The six ionic columns that once supported the portico of the Academic Hall and in the background to the right is the Engineering College building - Lafferre Hall. "The Big Tree" - a bur oak tree located in rural Columbia, MO that is approximately 350 years old. The magnificent Bengal tiger in official recognition of a group of local Civil War militia called "The Missouri Tigers." Their fighting spirit is is now embodied in MU's official mascot, "Truman the Tiger." In official recognition of a group of local Civil War militia called "The Missouri Tigers." Their fighting spirit is now embodied in MU's official mascot, "Truman the Tiger." Mizzou bleeds Black and Gold. 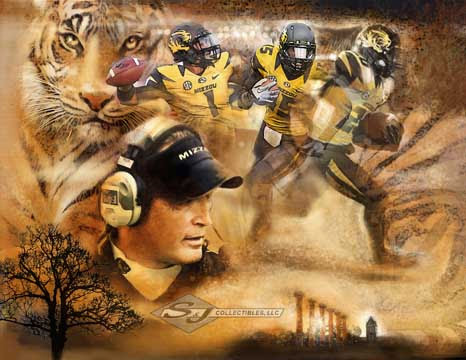 Therefore, the background and the entire painting is done in shades of Black and Gold which are the school's colors in keeping with the colors of the Bengal tiger. It has been stated that this is one of the finest paintings capturing the essence of the University and it's football heritage. This painting is now being made available in 3 very limited giclee editions and in one small framed open edition.